Triston is my latest BMG mini, and one I decided to finish now to 'get something done'. I have been in a painting slump for the past couple of weeks so I figured I needed to start something very simple or finish something that was well underway, and Triston fell into the latter category. I started the mini at the same time as August, around October or November last year. I think part of why I put him to one side was that the sculpt was rough in places, and poorly constructed in others (Knight were not very good about how they used generic parts on this one, namely how the head fits to the body). Thankfully Knight have improved their quality overall, although arguably that has been a costly lesson for anyone collecting everything from the range. Triston is armed with a Shotgun, which while limited to ROF 1, allows him mobility and taking potshots. Dirty Fighter allows him to fire the Shotgun within 5 cm, so I imagine he will perform best softening up targets for allies, possibly keeping close to the enemy player's presumed Ammo Objective. With Triston painted, my Joker crew is starting to get closer to fruition. I think I need one or two models to have it ready to game - either Arkham City Harley Quinn and the Shield Clown, or the new Jared Leto Joker. That will effectively make my fourth playable crew, so hopefully before too long it will happen. The nights grow darker and so the familiar refrain returns...."Braiiins.....". 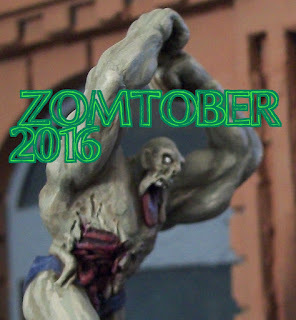 Zomtober 2016 is nearly here. 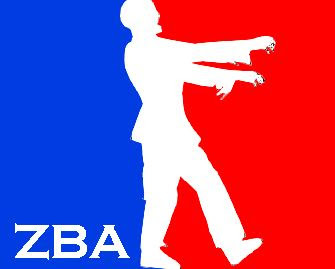 Once again the dead will walk off painting tables around the world, and maybe some survivors will be slapped around with hairy sticks in readiness to face the Zombie horde. This is the fifth year of Zomtober, and once again regular Zomtoberists Rob (click link for his blog) and Simon (click link for his blog) invite you to join in. Anyone commenting on this post will get added to the blog list below (and feel free to do something similar on your own blogs - the more we spread the word, the more can get involved!). Another BMG character completed, and my first iteration of the Joker - and the weakest of the bunch (so far) in game terms, but probably the simplest to paint, which is why he jumped the queue ahead of my part-done Arkham City Joker! Not my greatest painting, but he will do for a 'quick and done' paint-job. For those that don't know, this version of the Joker is from Frank Miller's Dark Knight Returns comic book from the 1980's, set in a time when Batman has been retired for a number of years, and when characters are in their latter years. This Joker is stripped down in terms of tricksy weapons (no Exploding Teeth or One Shot Gun Trait, an Automatic Gun and Precise Knife instead), but still brings the game manipulating Kaos Agent and Trickster, along with Cruel (a more expensive version of Arrest) at a super-low 70 Reputation. The difference in value to Arkham City Joker's 90 Reputation is essentially a Henchmen, so arguably this one is better geared towards creating a swarm, although he loses out on overall threat. I hope to add a Harley Quinn to the crew soon and finally feel able to field my first Joker crew, but as ever, time and focus will tell on whether I manage that! Aesthetically I like the Batman the Animated Series (BtAS) Harley with this Joker, but her Endurance 4 makes her a liability in-game, so that is not to be unfortunately. That turns me to Arkham City Harley who is a likely candidate for painting before too long.